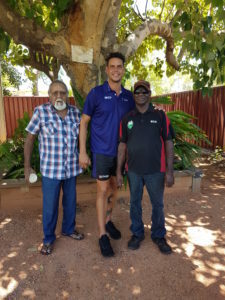 On a recent visit to Broome, the Kimberley Stolen Generation Aboriginal Corporation staff, members and their family met with the Fremantle Dockers Indigenous and Multicultural Liaison Officer Michael Johnson and Multicultural Liaison Officer Graham Mills. 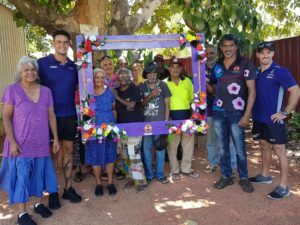 The Fremantle Dockers maintains a strong relationship with the KSGAC and helps to promote awareness of the Kimberley Stolen Generation people as National Sorry Day flower is often worn on the team’s Guernsey. Mid-year during the Indigenous round the KSGAC’s National Sorry Day flower will be prominently displayed on the front of the Guernsey. 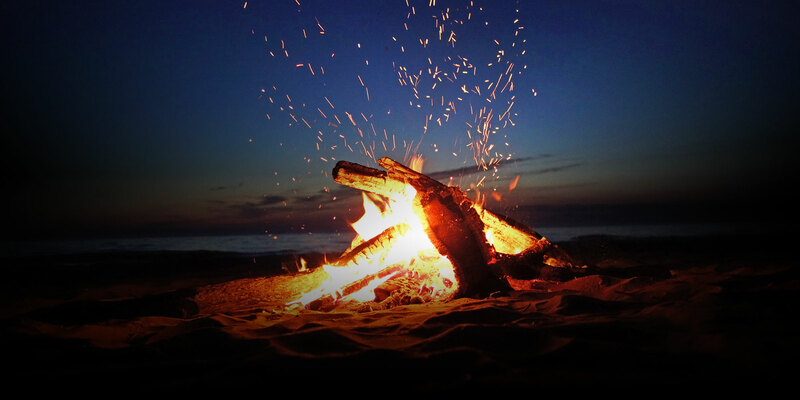 Mr Bin Bakar said, ‘In turn we show our support of their efforts on the field and beyond in helping Indigenous people with opportunities to achieve. We were very happy they came to spend time supporting the schools and our talented Broome youth. The Fremantle Dockers, like all other AFL teams, do wonderful work in the community, especially with school based activities and working with youth. The Club appreciates opportunities to speak with any business and/or organisation that may wish to sponsor them so they can in turn increase their presence in the community and spend more quality time working with young people and people at risk.” Said Mr Bin Bakar.